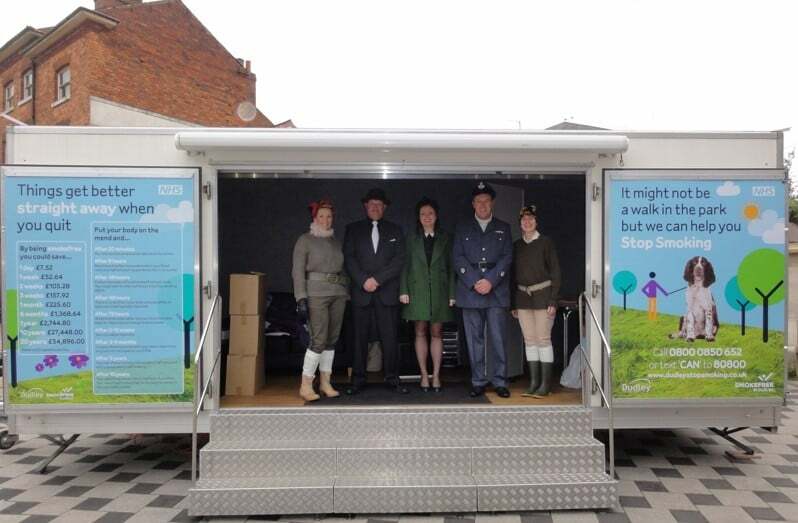 Exhibition trailer hire from TCM is a great way to consult with the public, undertake public health campaigns, provide healthy lifestyle advice and assessments, or to raise awareness of your charity or organisation’s work. 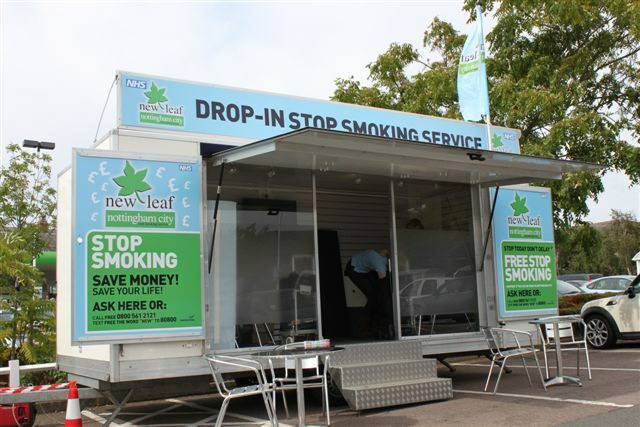 We have provided exhibition trailer hire for a range of private sector organisations and public health departments for health screening, diabetes roadshows, cervical cancer awareness, pharmacy campaigns and stop smoking services. 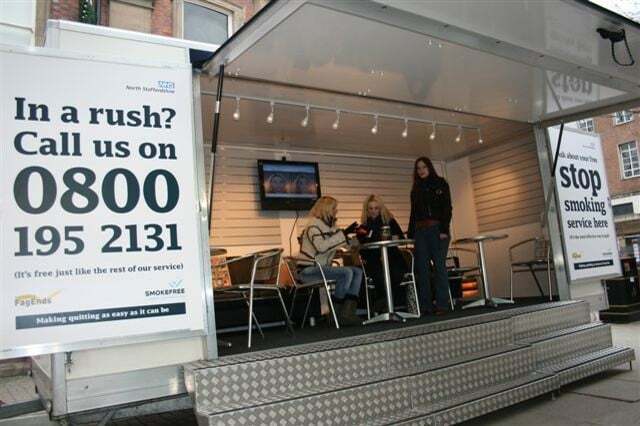 Trailer hire can be used for either awareness raising, linked to local and/or national campaigns (eg Stoptober or national No Smoking Day) or to provide drop-in sessions at advertised locations. 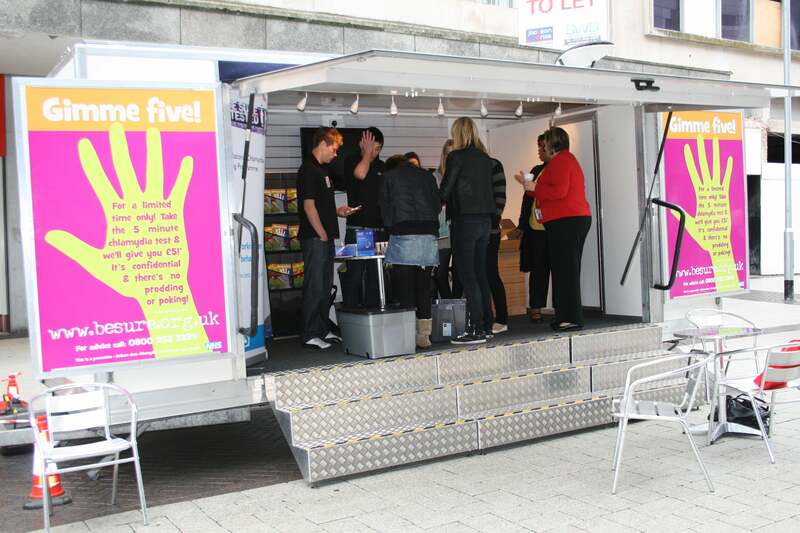 Our range of small to medium sized trailers are ideal for taking your message into high footfall locations with minimum fuss and maximum impact – popular venues include high street locations, supermarket car parks and outdoor markets. We can also provide options for re-usable trailer graphics to keep the costs down. 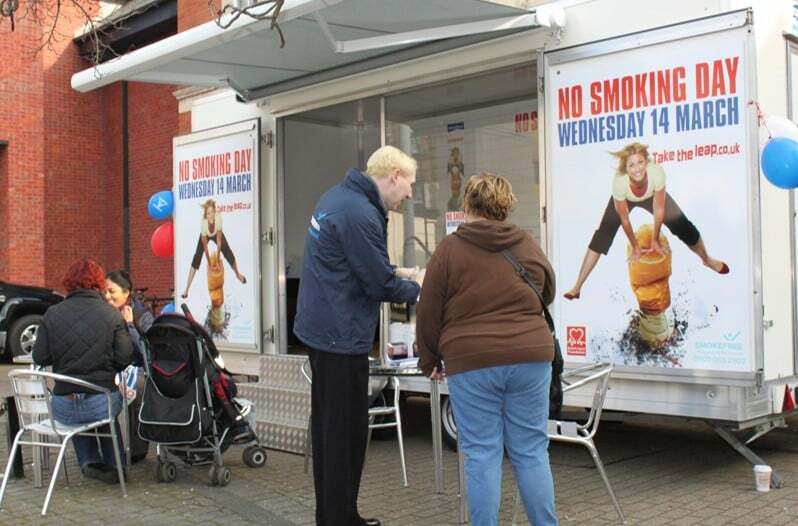 In 2011, TCM Trailers provided a mobile stop smoking unit for a university research study across 13 locations in the East Midlands as part of research into the effectiveness of using trailers in public locations as a tool for smoking cessation services. This research found that a trailer may be an effective way to prompt quit attempts for smokers not planning to quit, and also to reach smokers who would not engage with a stop smoking service. For a copy of the research paper or to find out further information about the study, call Lindsey on 01543 546474. 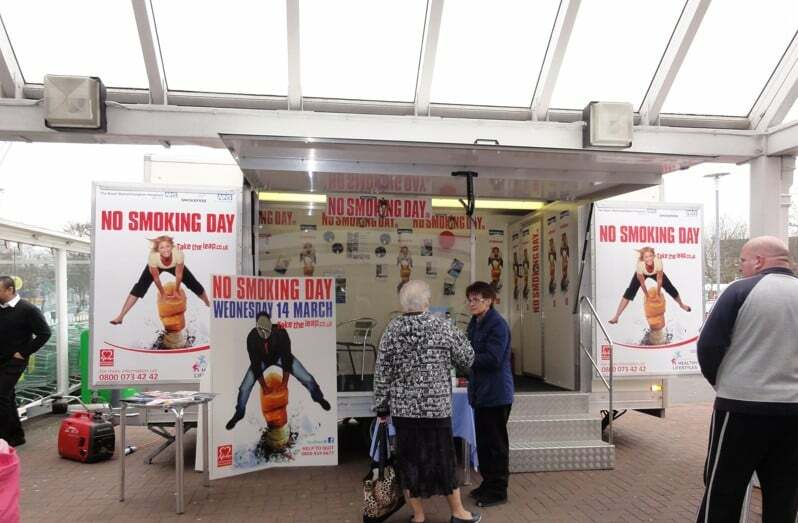 Each year on national No Smoking Day, during October for Stoptober events, and in the new year for New Leaf campaigns, we work with public health departments across England who hire trailers from us to tie in with their local social media and printed media campaigns, and to work with national publicity. Public health departments also use trailers from TCM to make sure that they hit their health assessment targets and for mobile health screening. One of our Health Improvement clients reported that they completed two months’ worth of health assessments in one week during a recent health lifestyles roadshow in London. 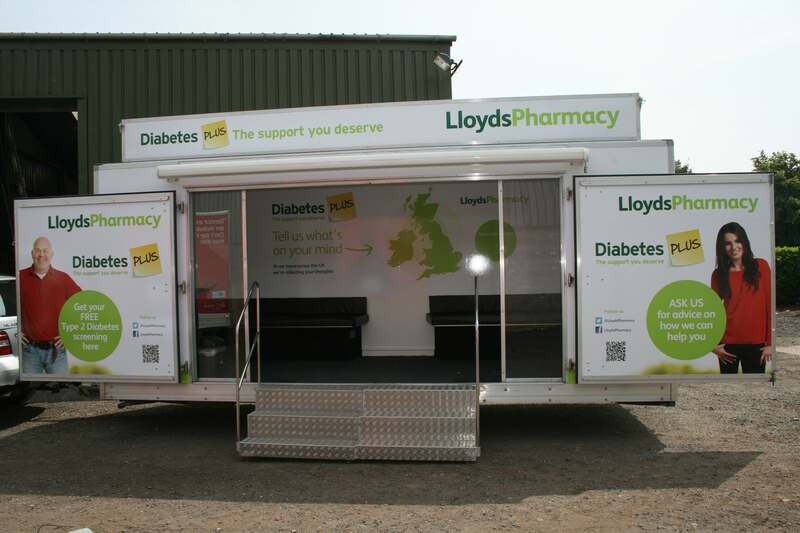 We also provided a trailer for the national Lloyds Pharmacy Diabetes roadshow, aimed at promoting awareness of the services available in local pharmacy stores and undertaking testing for diabetes at high profile locations across England, Scotland and Wales. Our range of small to medium sized trailers are ideal for taking your message into the high footfall locations with minimum fuss and maximum impact. TCM also offer a venue booking service for an additional fee which includes venue research and completion of all the paperwork required by the venue. We have personal experience of working in the public sector and the budget pressures and bureaucracy that entails. Where possible, we can fit in with payment terms required by public sector organisations and offer discounts for multiple bookings. All exhibition and roadshow trailers provided for hire by TCM are fitted with aluminium channelling on the wing panel doors. This allows re-usable foamex panels to be used, which are fitted to the trailer prior to delivery. These can be printed by TCM from artwork supplied by the client and are stored between periods of hire, providing a high impact, cost-effective solution to trailer graphics. To find out more, call Lindsey on 01543 546474. The tables below show typical prices for our range of exhibition trailers, but if you are planning to promote at more than one event in a year, discounts may be available – call the office on 01543 546474 to find out more.